For the fourth weekend in a row, the UFC graced television screens across the world with an action-packed night of fights. Fight Night 67, which went down in sun-kissed Goiânia, Brazil, featured action across six of the organization’s ten exciting weight classes. Headlined by a clash between welterweight favorites Thiago Alves and Carlos Condit, the card delivered as one with a little bit of everything—plenty of stoppages, a truly horrendous groin shot, and a main and co-main event that will never be forgotten. Here’s a recap of the action for those who missed it! In the evening’s main event, Carlos Condit made his long-awaited return to competition against the ever-dangerous Thiago Alves. For reference, there have been 94 other welterweight bouts since he fought last. It was a scrap that many pegged as a possible classic, and it certainly delivered. For two, beautiful rounds, the former welterweight title challengers exchanged crackling fire, painting the canvas red in the process. And though the doctor stoppage that kept Thiago Alves on the stool after round 2—due to a visibly broken nose—was a little anti-climactic, the fight was a roller coaster while it lasted. 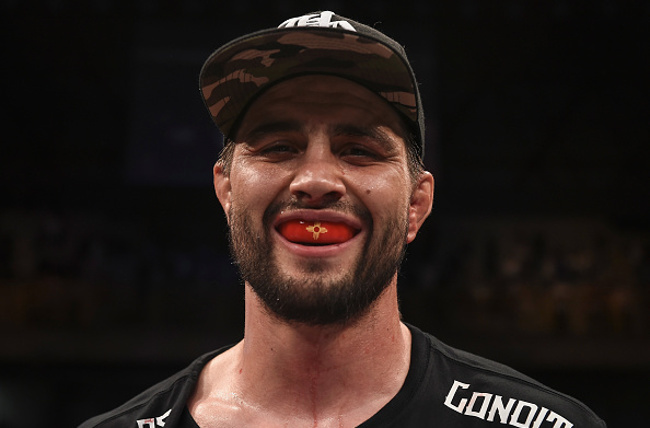 Condit re-entered the welterweight chaos like a canon blast, and Alves showed that he’s got a lion’s heart under his burly chest. In victory, Condit bounces back from a tough loss to Tyron Woodley back in March of 2014, and reminds the world why he is considered one the best welterweights on earth. The owner of a 30-8 record, he’ll need another win or two before he re-enters the title talk, but thankfully, Johny Hendricks needs a dance partner. Let’s just hope they get five rounds to sort it out this time. Alves, on the other hand, doesn’t lose much ground in defeat. Though he had two-fight streak snapped by the loss, his wolfish aggression and crippling power make him a dream matchup for any welterweight on the roster. Now the owner of a 21-10 record, his title-challenging days may be over, but his bonus-collecting days are certainly not. He’ll fight another day, and that’s to the benefit of every fight fan on earth. UFC Goiânia’s co-main event spot featured a rematch between featherweights Nik Lentz and Charles Oliveira, who fought to a controversial, but bonus-winning no contest as lightweights back in 2011. Both fighters, and all those who watched on, hoped for a more concrete result this time around. After two and a half rounds of madness, that’s precisely what we got. Round 1 was close, but probably belonged to the Brazilian. Round 2, on the other hand, was all Lentz’s—and perhaps even warranted a 10-8 score. In round three, Oliveira removed any room for controversy, putting an epic rivalry to bed with a slick guillotine choke. It was a fight for the history books in which all facets of the game were showcased. 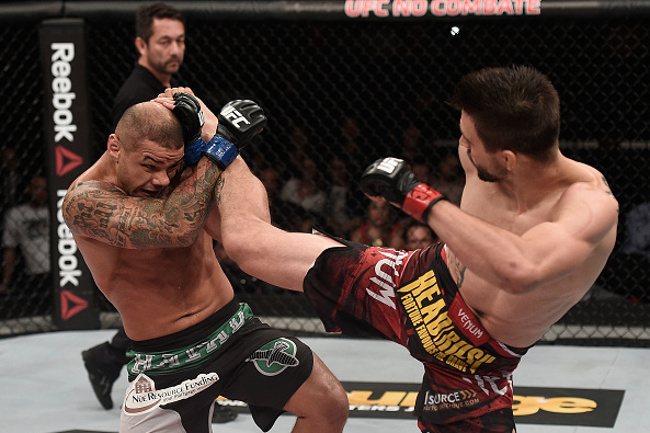 In victory, Oliveira now finds himself on a four-fight win-streak—a veritable ticket to contender status. At 20-4 and just 25 years old, any number of fights now make sense for him, though perhaps none appeal more than a scrap with fellow contender Max Holloway. Lentz, on the other hand, returns to the loss column after defeating Manny Gamburyan just over a year ago. Now 25-7, the loss is bound to sting, but “The Carny” figures to remain a staple of the featherweight top-15 for some time. From the early vantage point, the pairing of welterweights KJ Noons and Alex “Cowboy” Oliveira seemed to have all the makings of a Wild West gunfight. As two men not known for their grappling skill, the bullets were expected to fly on the feet. Instead of playing such a high-stakes game, however, a crafty Oliveira wasted no time in grounding the bout, before sinking in a beautiful, first round rear-naked choke. The victorious Cowboy, who usually competes as a lightweight, now enjoys a solid record of 11-2, and erases the memory of an armbar loss to the talented Gilbert Burns back in March. Noons, on the other hand, slips to a tough 13-8 overall record, and has a two fight unbeaten streak (ignoring a no-contest in that stretch) broken by the defeat. While he remains one of MMA’s truly talented punchers, his deficiencies on the canvas render him a real question mark. Ryan Jimmo doesn’t have the best luck. After losing two of his last three fights via injury, he very nearly lost a third in the same way, as a second round Francimar Barroso groin-kick sent the him careening to the canvas, dry heaving in pain. And though he was able to continue after a full five minute rest, he then found himself on the wrong end of an ugly unanimous decision. There’s no sugar-coating this one: it was a fairly forgettable fight. In defeat, Jimmo stumbles to 19-5 and 3-4 in the UFC, having alternated wins and losses since joining the organization back in 2012. Now on the first two-fight skid of his career, the Canadian has some serious work to do if he hopes to keep his job with organization. Barroso, on the hand, who now sits at 17-4 overall, distances himself from a tough, split loss to Hans Stringer over a year ago. Originally slated to take on the surging Gilbert Burns, Ireland’s Norman Parke looked to make the most of a bad situation with a win over replacement opponent, Francisco Trinaldo. Unfortunately he was not able to do so. 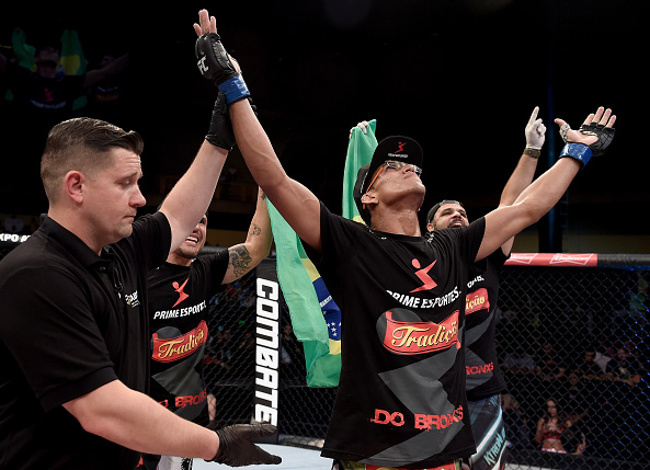 At the end of a back-and-forth fight that forced both men to dig deep, Trinaldo was awarded a split decision win. 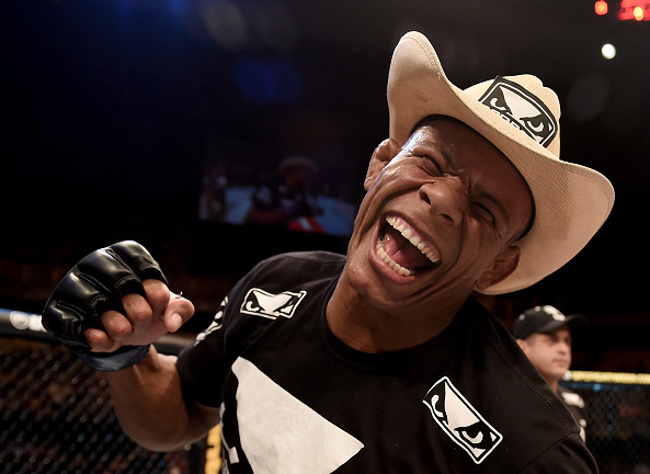 In victory, Trinaldo finds success in his 10th UFC bout, and extends his win-streak to 3. Now 17-4, he is slowly edging his way toward the lightweight top 15, but at 36 years old, the Brazilian bomber is running low on time. In defeat, Parke stumbles onto the first two fight losing streak of his career, having lost his last bout to another bulky Brazilian southpaw in Gleison Tibau. Now 20-4, the 28 year old Alliance MMA rep has certainly hit a snag, but still has plenty of time to turn things around. Of all the debuting fighters on this action-packed card, perhaps none impressed as much as England’s Darren Till. Undefeated as a pro, the 22-year-old welterweight left no room for controversy against his far more experienced opponent, Wendell Oliveira. Over the course of the first round, the Brit’s output was slow as he looked to find his range with kicks, but the second round was a truly dominant display. After dragging his opponent to the ground, Till removed his batteries with a series of big elbows from top position. The knockout is the 10th of his young career, and elevates him to a pristine 13-0 record. Oliveira, on the other hand, now owns a record of 24-9. More importantly however, he has lost both of his UFC bouts by knockout. Despite his obvious talent, his getting a third chance with the organization seems unlikely. In the final bout of Goiânia’s preliminary card, Rony “Jason” Bezerra corrected the night’s submission drought with a beautiful first-round triangle choke over fellow grappler Damon Jackson. Despite eating an illegal knee against the cage, the TUF: Brazil winner was able to brush away the cobwebs and score a much-needed win—his first since defeating Steven Siler well over a year. Now 15-5 overall, Bezerra moves to 5-2 in the UFC. He has fought all seven of his UFC bouts in Brazil. Jackson, on the other hand, tastes defeat for just the second time as a pro. Now 9-2 overall, the former Legacy Fighting featherweight champ has yet to win in two UFC appearances, and will need to impress in his next bout if he wants to stick around. In a largely unheralded contender bout, Brazilian flyweights Jussier “Formiga” Da Silva and Wilson Reis went at it in hopes of taking an important step up the divisional ladder. The 6th and 12th ranked fighters in their weight class, the stakes of this bout were amongst the loftiest of the night. 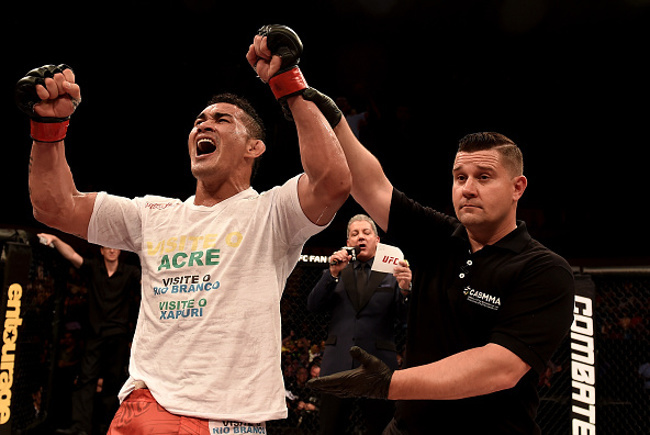 In the end, it was Formiga who made good on the opportunity, earning a unanimous decision victory. As is so often the case when decorated grapplers collide, the difference-maker in this one was the stand-up game. Despite his one-time deficiencies in that department, Formiga was the man behind the better punches throughout the bout, repeatedly catching Reis with popping counter rights. In victory, his record inflates to a solid 18-3, and he takes another step toward a shot at Demetrious Johnson’s well-guarded throne. Reis, on the other hand, tastes defeat for the first time since dropping to the flyweight division. He is now 19-6 overall, and 3-2 in the UFC. The second bout of Goiânia’s televised prelims paired debuting welterweights Nicolas Dalby and Elizeu dos Santos—both regional league champions in their home countries—in an absolute gun fight. For three, close rounds, the two welterweights swapped leather and flaunted concrete chins in a definite contender for Fight of the Night. Throughout the bout, both men landed plenty of meaningful offence, but in the end, Dalby’s ability to mix takedowns into his strategy earned him a split decision victory. The win keeps the 30-year-old Dane undefeated, moving him to an awesome 14-0 overall. Dos Santos, on the other hand, slips to 14-5 overall. That being said, he certainly didn’t lose any fans in defeat—the dude was head hunting from bell to bell. The first bout of Fight Night 67’s televised prelims paired decorated striker Lucas Martins with 24-year-old Bosnian Mirsad Bektic who, with an unblemished record, is one of the brightest shining prospects on the MMA horizon. The bout featured the widest betting odds of the night, with Bektic pegged as a -450 favorite by most sources, while Martins sat around +350. As the odds suggested, this one turned out to be another showcase for the hyped Bosnian. Using not only the wrestling for which he’s known, but an improved stand-up attack too, a patient Bektic troubled Martins everywhere en route to a second-round TKO. Now 10-0, the young ATT product can expect a step up in his next bout. Martins, on the other hand, slips onto a 2-fight streak, and now owns a record of 15-3. Goiânia’s second bout paired two Brazilian strawweights in the lone WMMA offering of the night. In one corner was Juliana Lima, who entered the bout with a 1-1 UFC record. In the other was undefeated debutant and former Jungle Fight champion Ericka Almeida, who replaced Jessica Penne on short notice. Despite the hype that carried the young Almeida onto the canvas, she was soundly defeated by her 33-year-old opponent. For three rounds, Lima controlled the fight with a smothering top game and plenty of ground-and-pound—more than enough to earn her a unanimous decision win. The victory moves Lima to 8-2 overall, and with three appearances in the UFC’s new strawweight division, ties her with Joanna Jedrzejczyk for a divisional most. The defeated Almeida, in contrast, now sits at 7-1, with the difficult task of coping with her first pro defeat at hand. The action began with a dominant showing by debuting Brit, Tom Breese, who took on Luiz Dutra in an interesting welterweight pairing. Having scored six of his previous seven wins by submission, Breese is known primarily for his grappling. In Goiânia, however, the 23-year-old was able to showcase his improving stand-up game. After dropping his Brazilian opponent with a punch, the Brit made good on his UFC debut with a first-round TKO—just the second strike-induced stoppage of his career. He now sits at 8-0, while his opponent falls to 11-4 overall and 0-2 in the UFC.